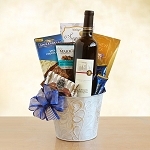 No matter what the occasion, nothing says "enjoy the day" quite like an incredibly thoughtful gift basket filled with wine and beer. 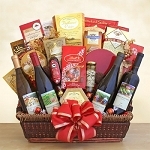 At GiftProse, we are firm believers in the power of a beautifully personal gesture, and we fill each and every gift basket with warmth, love and a plethora of delightfully tasty treats. 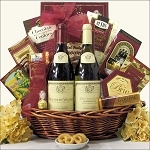 If you're looking for a housewarming gift, a "welcome to the neighborhood" gift, even an "I was just thinking about you" gift, an affordable wine & beer gift basket from Gift Prose is a beautiful gesture that sends the right message every time. 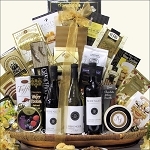 Choose from one of the fabulous gift basket offerings below, like the Green Truck Organic gift basket, chock full of eco-friendly deliciousness like organic chardonnay, all-natural Dagoba dark chocolate and mouth-watering shortbread cookies. 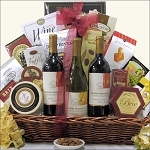 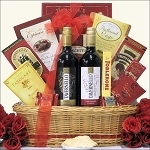 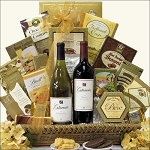 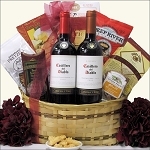 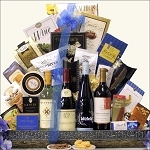 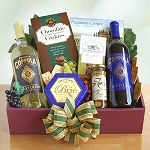 For the ultimate gift, check out the Gourmet Deluxe Wine Basket, with five different amazing varietals, plus smoked salmon, Ghirardelli and Godiva chocolates and so much more. 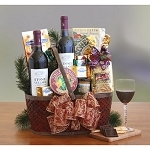 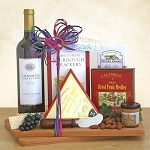 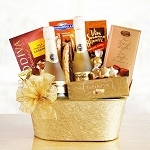 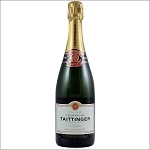 Click on your favorite gift basket below to get started, or give us a call today at 866-933-GIFT.